If all the other points raised so far such as CG are OK then I suggest a very close look at the wing to see if there is washout or wash in on this wing. Peter's recent designs have a special wing build sequence which uses the LE &TE sheeting pinned down first which gives clearance for the slightly curved underside of the ribs without using other packing. This method works well and the sequence needs to be be followed exactly. However if another method of building is used then maybe some unexpected twist occurred? Would be interesting to know if Donald used Peter's sequence or used some other method of wing construction. To update you all I have repaired my Ood hopefully for a final time. The right wing now has a slight warp I can do nothing about due to a difficult repair and the fuse has exterior 1/32 ply plates on each side as it's broken in half there before. I carefully rebalanced it to make sure the CG is exactly per plan. The flying is not too bad considering its repeated surgery but I still have to land fairly fast if it's not to drop too hard on the deck on flair out. It has to be flown in all the way and if I don't get a bounce or two I'm lucky. If our field wasn't an aircraft carrier strip there would be no problem as I could just grease in anywhere I fancied, but that's not the case so we have to land accurately. Hi Peter, Hi all. New member and I wish I'd found this topic before I started building Oodalally just before Xmas. I'm going electrickery with Turnigy 1450, 80A ESC, 4S 2200 and 8x4 prop. My build quality isn't a patch on some I've seen here but I've hand cut this from tiled PDF downloaded from Aerofred. My first what I call scratch build. I see some here have built it from a CAD cut wood pack. Is there a CAD file available that I could laser cut from? 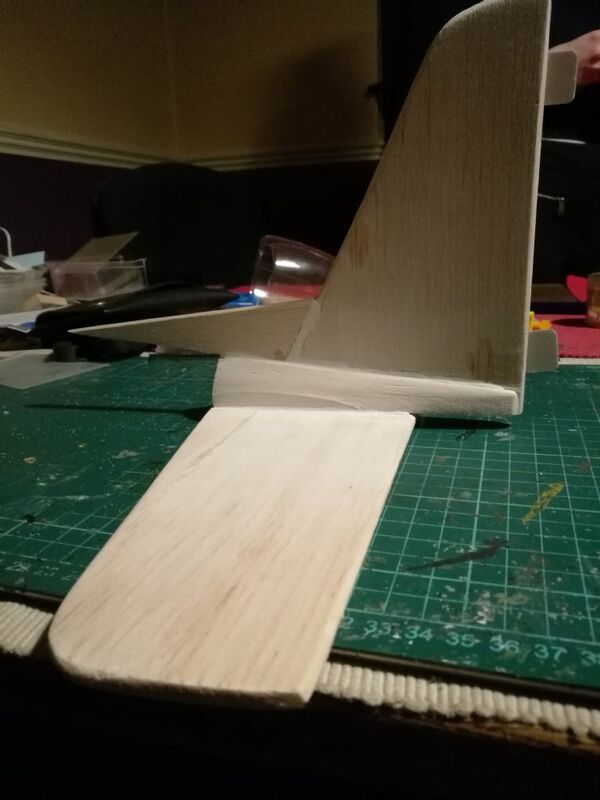 My cutting skills mean the formers have given the fuselage an interesting shape, which has lead to having to use gauge sticks on the wing LE's to get the horizontal stabiliser true. I've used 9g servo's in the wing and in the rear of the fuselage. Covering starts soon. The article says to cover the rear stabiliser before gluing in place. I suppose this is much easier than after? It seems you're enjoying the build. 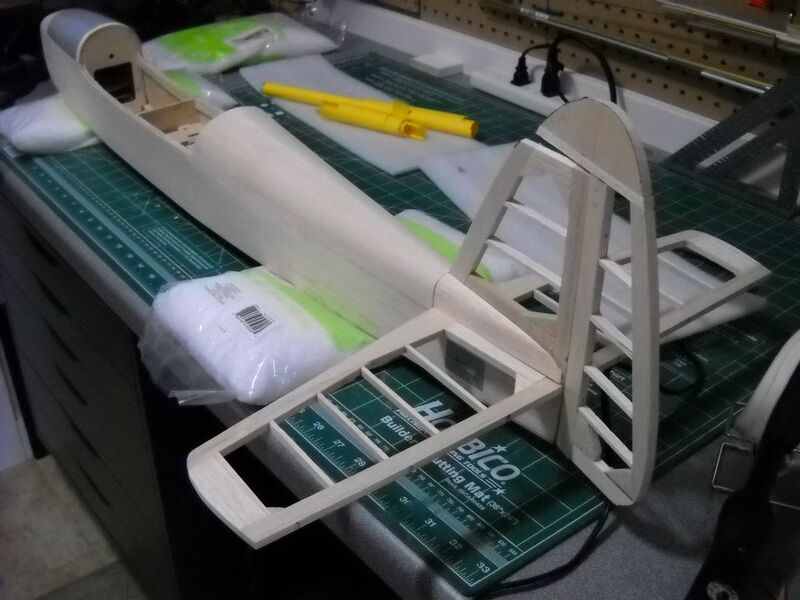 If you feel you may build more models in the future, then consider getting yourelf a SLEC Building Jig, as one of these makes the job of getting the fuselage straight and true much easier. The theory being that you'd mark a centreline on each of the fuselage formers. The building jig has a centreline marked on it, so as you construct the fuselage in the jig you simply keep all the centres lined up, then the resulting fus ought to be straight.....some fuselage jigs have adjustable supports for mounting the tailplane (horizontal stabiliser) accuraely prior to fixing in place permanantly. My own is one such jig. And yes, it's much easier to cover the tailplane and fin before you fix them in place. It can be a fiddly job otherwise. I'm not aware of Cad files for the free plans in the mags. Chances are, once you'd been a forum member for a little while, someone might have offered to send you an unwanted copy of the plan for the price of a stamp. The beauty of the CAD cut parts sets are that the paired parts - 2 fuselage sides for example - are of matching grades of balsa. Failure to use matching grades may mean you inadvertantly build twists and warps into the structure. It's highly undesirable in a fuselage, but it's fatal in a wing! I ought to set my profile name. Didn't realise the user name was going to be site name. It's Mike by the way and thanks for the welcome. I will be posting in the new members section saying hello, I got to the end of the topic and signed up. I have looked at that jig and I actually bought the wood to build the plane from Slec. Yes, a fuselage jig is a very desirable bit of kit if you plan to built occasionally. 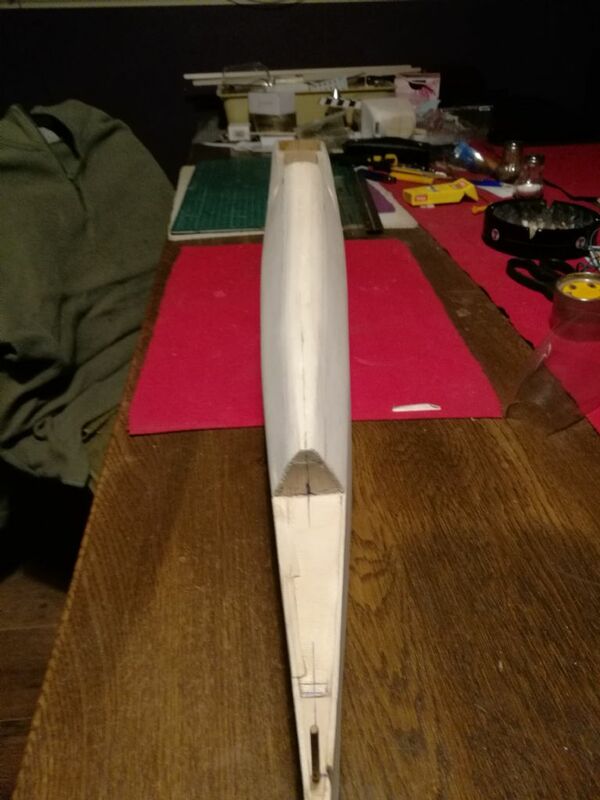 Some builders do manage without one, but it does make the built easier if you have the means to jig certain parts of the structure such as the fuselage. The wings have to be built fixed to the building board, and cannot be built *free* if you get my drift. It's important to get as much of the wing built and sheeted prior to lifting it from the board, because if you remove it too early then twists and warps might appear. I omitted to mention earlier Mike that prior to fixing the tailplane in place permanantly, the model ought to be mostly covered. You don't apply covering to the areas of the fin and tail which are to be glued though. Hinging the control surfaces is another part of the build which is probably better left until the model is covered, although some cut the hinge slots prior to covering. My own jig is about 25 years old, and was produced by Aerotek. These are no longer produced, but were a good solid jig. It has the adjustable supports for adding the tailplane while the fuselage is in the jig. The slots at one end are where the tailplane alignment adjusters bolt on when needed. I have to say that I don't have a jig. I just use a pair of mark 2 calibrated eyeballs!!! Another tip for the tail. I spot glue a piece of scrap 1/4 sheet down wherfe the tailplane goes. THen I spot glue another scrap of 1/4 sheet down where the fin goes. FInally I spot glue peices of 1/2 sheet or block in and shape gthe whole lot to match the rear of the fuselage. Separate all this and you will have two blocks to fair in the the fin and elevators. This saves so much fiddly carving and shaping if you try and shape them with the tailin place. Also you can cover the two fairing blocks before assembly...Again much easier. I think the laser cut parts from Sarik are only the shaped parts not the full quantity of balsa needed. 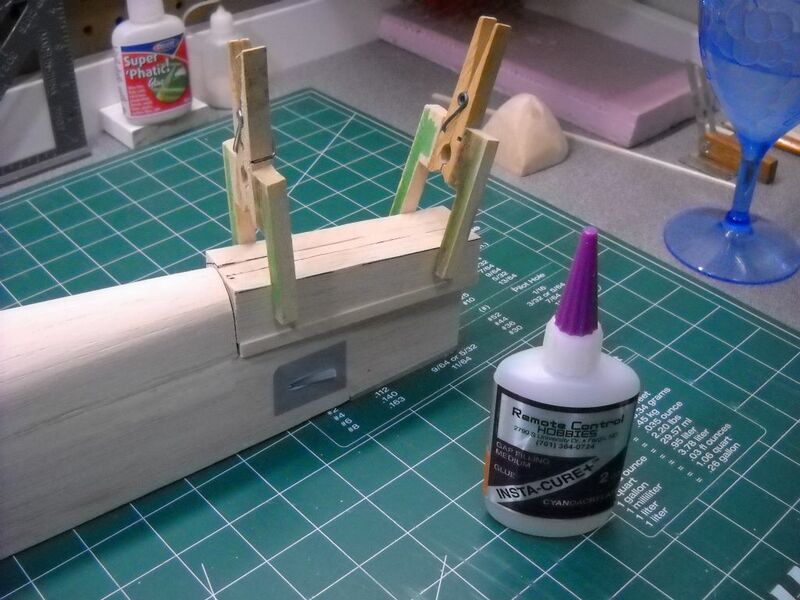 They can supply another pack of standard lengths of balsa to complete the build in some cases. Extra cost of course. So you still need a supply of balsa! You could look at any of the other builds on the forum for extra tips and photos of some of the tricks and techniques. Also look at " Features" at the top of this page where there are many articles available under the different headings. Our mum had something lined like that jig on her kitchen floor, which has just reminded me of the lino our dad used when resurfacing a work bench. Getting things in line isn't my problem, it's cutting by hand at the dining table. With these vari-focals the sides of everything are curved. I've seen that method used for fin fairings on a Piper cub build. I'll log in using my phone at some point and get a few pictures up. Perhaps a set of cheap reading glasses may be useful for cutting parts out? Or maybe even consider that CAD parts set? As kc points out, it isn't a full kit but does get you all the parts that would need cutting from sheets of balsa or ply. 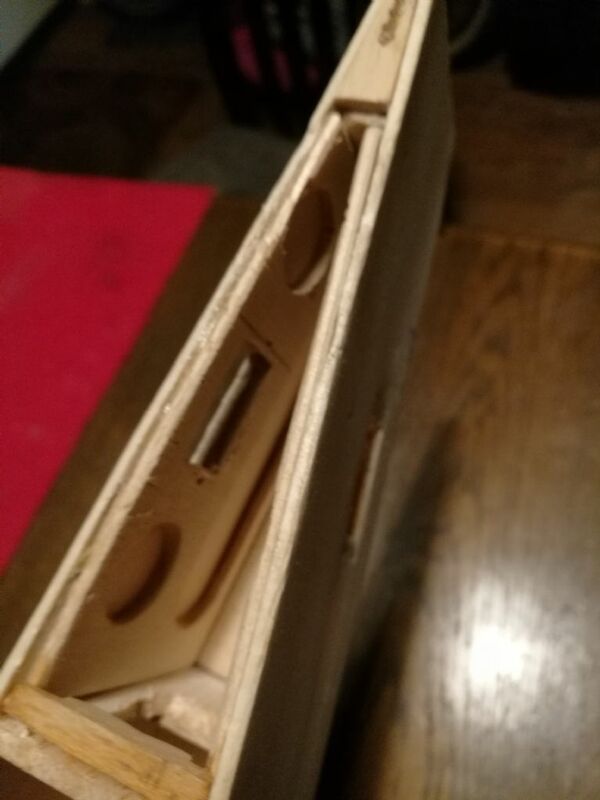 You would still need to purchase some additional wood to finish the model. P.S. The lines/grid on the jig is there for a very good reason Mike. It helps keep everything square and lined up when it's clamped in the jig. Hi Mike and welcome to the forum and your Oodalally build. I don't know which 9g servos you are using but I thought I would mention that some 9g servos work fine in lightweight depron models but may struggle a little in an Oodalally. The ailerons may not be so critical but I would tend to use something like these Corona DS929MG servos. For the elevator in particular I would be inclined to use something with a little more power like a Hitec HS85MG or alternatively this. Your chosen servos are probably fine but I thought I would just add my 2p worth. Preshaping the fairing blocks works well for me also. I needed to do that on my Grumpy Tigercub model. If you use the micro servos metal geared ones are essential. I got some Turnigy ones from Hobbyking which actually have a torque of 3 Kg per cm on six volts. Tower Pro servos. Metal gears, high torque. I've seen them in the same position on similar planes so hopefully there wont be any issues. You don't need to worry overly about the control horns Mike. Just be sure to include them in regular airframe checks every few weeks, or more often if you're keen. Some might do a quick check before each flying session, and quite honestly it's a good habit to get into..... I've had just one let go in almost 50 years. Another thumbs up for pre-shaping the tail fairing blocks here. You can't do this at all easily if the tail parts are fixed in position. Would second the above posting about going to a bigger servo, something around 20g at least. The Hitec HS85MG are a good shout. 9g servos are fine for 1lb foam models, but a bit out of their depth on a 3 or 4lb wood build, in my opinion.
" I'm going electrickery with Turnigy 1450, 80A ESC, 4S 2200 and 8x4 prop"
Just a thought, what is the exact motor you have? The combination of 8x4 prop and 80A ESC for this model seems a bit odd. SLEC scrapped the whole batch. Apparently the p;astic was not the normal type that they used. Not their fault. I still bend them every so often but never have a failure since. THat 8X4 prop sounds uselless for a model of the size. It is alwys more efficient to move a lot of air backwards slowly and a 10" prop or even bigger. Why not give George at 4-Max a call.He will advise very accurately what you need. I know that I always call him for advice and it works.